Place a large pot of water on to boil for spaghetti. When it boils, add salt and the spaghetti and cook to al dente. Drain the water and set aside. Follow packet instructions regarding the boiling time. Check out this guide on Cooking Spaghetti Noodles. For the meat balls : In a mixing bowl, mix all the ingredients for the meat balls and roll the meat mixture into 1 1/2 inch medium-sized meatballs. Heat 1/4 cup oil to a large skillet over medium heat and add the meat balls. Cook until the meat balls are golden brown on all sides. Remove the meatballs to a paper towel lined platter. Repeat in batches until there are no remaining meatballs. For the sauce : Heat a pan over moderate heat. Add olive oil, crushed pepper, garlic and finely chopped onions . Saute for 4-5 mins till the onions become soft. Add the pureed tomatoes, chicken stock, bay leaf, chilli flakes, basil, oregano and salt. Bring to simmer and cook for 5 mins. Add the meat balls, lower the heat and cover and cook for another 15-20 mins . Add the grated cheese, mix and remove from heat. To serve : Serve spaghetti topped with meatballs in sauce; sprinkle with grated Parmesan cheese. 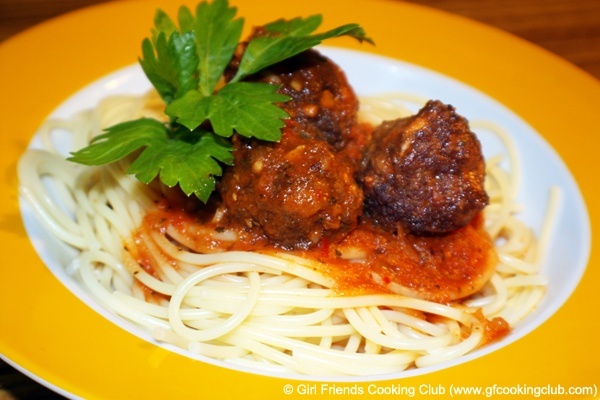 This entry was posted in Chicken, Pasta, Pork and tagged Spaghetti and Meat ball by Kamakshi. Bookmark the permalink.